Greetings one and all! I hope you are doing well and loving life. Once again, I invite you to take a deep breath, pour a cup of coffee or hot tea, and relax. No doubt, you need a little break in the action, right? As a caregiver, I imagine you approach the journey like the majority of other caregivers in the United States. You choose to fly solo—assuming the lion’s share of responsibility for care. Sound familiar? Please know, I am not being critical of your approach to care. I have launched several solo flights of my own over the course of a lifetime. And by so doing, I experienced the often devastating repercussions of trying to wing it on my own. 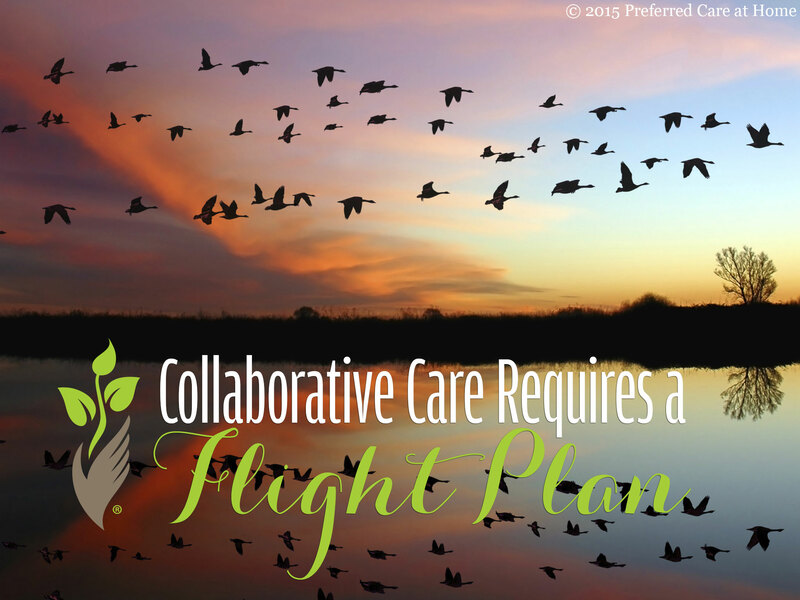 So today, I have an alternative flight plan to share with you—collaborative care. Collaborative care is not a specific model of care. Rather, it is a philosophy of care—an approach to care. A collaborative approach encourages the participation of everyone affected by a caregiving situation: care receiver, family members, friends, health care professionals, and professional caregivers. Collaboration ensures that no one person is responsible for all of the heaving lifting. Instead, the caregiving responsibilities are disseminated throughout the caring community. Consequently, primary caregivers avoid compromising their own health and well-being in the process of caring for their loved ones. Ultimately, collaborative care is an effective and a beneficial way to care for others and for ourselves! Mutually beneficial. Fabulous! 1. Geese fly 71% farther in formation due to the lift generated by the collective. Geese literally “lift” each other up by flying in formation. Message to Caregivers: Flying solo will not serve you well over an extended period of time. Allow others to “lift” you up from time to time—allow others to assist you. 2. Geese share the responsibility of leadership. When the lead goose tires, it rotates back in formation allowing another goose to assume the demanding point position. Message to Caregivers: Sharing the responsibilities of care alleviates the pressure to be “on point” constantly thus reducing the stress of caregivers. 3. In flight, geese honk to encourage and to motivate each other. Message to Caregivers: Remember the importance and the power of a kind word, a gentle touch, and a heartfelt honk when the going gets tough! 4. Finally, no goose is left behind. If a goose falls out of formation due to illness, two other geese follow it to the ground. The goose will be companioned until it either recovers or dies. But rest assured, the goose will not be alone. Message to Caregivers: Companioning our loved ones to the end of the road is a daunting challenge indeed. However, it is also our sacred responsibility and honor to witness the journey. Today, if you are feeling a wee bit weary and overwhelmed by the challenges of caregiving, remember our friend the goose. Now that you know the potential benefits of flying in formation (collaborative care), perhaps you will opt to modify your current flight plan. There is no need to continue your caregiving journey “on a wing and a prayer.” Identify potential collaborative partners—personal and professional caregivers—who will come together for the purpose of caring together. Then, enjoy your flight!